Several years ago, someone wrote and asked, “Why did Christ have to die on the Cross?” It is the question that prompted this article. On September 14th (New Calendar), the Church marks the Feast of the Elevation of the Cross. It is a fitting time to ask, “Why did Christ have to die?” His death and resurrection are the utter foundation of the Christian faith. Either we can answer this question, or we have nothing to say. I was hoping, based on the title, that you were going to discuss something that I have long wondered about, namely: Why Christ have to die *on the Cross*? I understand why He had to die. But why, specifically, by way of scourging and crucifixion? Or do we believe that the method of death was secondary and somewhat culturally contingent? Put another way, could Christ have died in some other manner? I hope this makes sense. Thank you for your answer. Thank you, Father! Glory to God for all things! If you want a online book, this one is excellent from the Arthur Custance site: Two Men Called Adam. It may be rather long for some to read, but if you take one chapter a day you will get insights that may enlighten. and upon all your people. It’s interesting you ask that, (again there are a few tangents someone could go off on here…) as I was thinking similarly on that question, and thought that Father’s answer (the short one), that Christ “died because we were dead”, also answers the method (Crucifixion) of His death. To be clearer, He was crucified because we were “crucified”, he tasted of everything (meaning of the whole possible gamut of Hell), no matter how rare and dark and desperate; in order to transform it and become the eternal solution to those (someone or many or all of us) who were there. There is therefore no desperation that can ever overcome us any more! All tribulations, with faith in His love, become just vehicles of our salvation. I am having troubles posting an answer to you. Let me try this short ‘test’ comment to see if it appears, and if it does I might re-post the long answer in tiny chunks. It’s interesting you ask that, (again there are a few tangents someone could go off on here…) as I was thinking similarly on that question, and thought that Father’s answer (the short one), that Christ “died because we were dead”, also answers the method (Crucifixion) of His death. To be clearer, He was crucified because we were “crucified”, he tasted of everything (meaning of the whole possible gamut of Hell), no matter how rare and dark and desperate; in order to transform it and become the eternal solution to those (someone or many or all of us) who were there. So, are you saying that since humanity descended so far into the ugliness of death, Christ’s manner of death had to be somewhat proportionally appropriate? I hope that doesn’t sound crude. I see, that makes a lot of sense to me. Thank you, Dino. The Scriptures describe Christ as the “Lamb slain from the foundation of the earth,” which means, in some manner that He was always crucified – and the Cross fulfills that (just to turn history on its head for a moment). As Dino notes, the Cross is not only death, but was, in its time (which was the fullness of time), a shameful death. In Judaism, it was the manner of the most shameful death (“cursed is everyone who hangs on a tree”). So in the fullness of time, Christ enters the very depths of suffering, alienation, shame, etc., in order to fill its emptiness with His fullness, and to bring us out (“He did not cease to do all things until He had brought us up to heaven” St. John Chrysostom says). That Cross from the foundation of the earth, is revealed throughout the OT, in every tree, in every piece of wood, in every motion crossing the hands, extending the hands, etc. Christ’s Pascha (which includes the Cross), shaped the universe. For the universe in which we were created is also the universe in which we fell, the universe in which God makes Himself manifest and re-creates us, the universe in which we are united together with Him, along with the whole universe. Thus, everything is shaped by Pascha and reveals Pascha. There are many times that the experience of our life is far more the Cross than the resurrection, but even that experience is being shaped by Pascha and is not for our destruction, but will, by the mercies of God, be for our salvation. The scandalous, crucificial “respect” of His creature’s freedom is “ingrained” in the Creator from the beginning of time. It is the perhaps the most crucial aspect of that Love that passes all understanding… Being the “Lamb slain from the foundation of the earth,” his sacrificial slaying culminates in His inconceivable respect of our freedom to even sin against Him as we do on Calvary. And this is the scandal of His Love that passes all understanding, we cannot comprehend – being dependant on “receiving” ourselves. He “offers”, He is the ultimate offering on the Cross. The omnipotent One, He who is the meaning of His creatures’ existence, voluntarily takes the lowest position so that we, in turn, can be lifted up from it, to the highest. The respect of God proves itself to the point of becoming crucified by those who’s freedom to sin he has respected -respected to the inconceivable point of zealously becoming the subject of their wrath, the subject that can and does forgive them when they crucify Him. Let us also remember (another point) that they Crucified Him because he did not fulfil the image of the sort of God they would have rather liked or expected…He did not fulfil it due to his extreme respect, humility and love. The Jews wanted worldly Power to serve their vested interests (against the Romans) but God -given the dilemma to ‘crucify’ another or be crucified Himself – ALWAYS chooses to be crucified Himself. And this is what Grace teaches His Saints. This is what St Silouan kept going on about with the centrality of love of enemies and Christ like humility. Think of the “crucified” merciful Father of the prodigal who wants him dead (well, in essence dead, so as to inherit his due, as if he had died before His time). Does He enforce? No. It was hearing those words that convinced me of the truth of Orthodoxy as an inquirer when I first visited our local mission. They resonated deeply with me then & they still do now more than a decade later. Boyd, Personally, I back towards the door when the ‘real’ meaning of apostolic transmission is divorced from the apostolic teachings of the fathers. Rohr, a liberal Roman Catholic should understand that danger as well as anyone. Outside the Church it is easier to fall prey to the “special” transmission of a Jim Jones or the shamanism of a Rasputin. Stray from the Fathers and one may find oneself in a church where the Eucharist is no longer offered (it happens a lot, you know). For a reading of what I think you are trying to say, get a copy of Elder Joseph the Hesychast and read therein a moving account of spiritual transmission between teacher and pupil in the Orthodox (i.e. 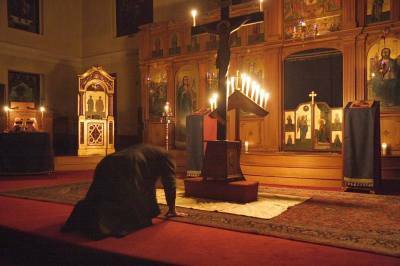 traditional/apostolic/patristic) meaning of the term. Boyd, I was not speaking so exclusively. Rather, warning of the many, unaccountable ministries that today fill the world. Rohr is right only in that life begets life, but that is not individual to individual, but is resting in the community. Any other configuration denies the clear teaching of the Scripture and the Tradition. Excellent article Father , it was just what I needed . “For since the law has but a shadow of the good things to come instead of the true form of these realities, it can never, by the same sacrifices that are continually offered every year, make perfect those who draw near. Otherwise, would they not have ceased to be offered, since the worshipers, having once been cleansed, would no longer have any consciousness of sins? But in these sacrifices there is a reminder of sins every year. For it is impossible for the blood of bulls and goats to take away sins. That is, Christ leads the life of love and obedience — of total self-sacrifice — which man must render unto God in order to secure communion. He alone accomplished this great feat, but we can share in it through union with Him by baptism and the eucharist. Thank you for this article, Father. Thomas. I make this mistake commonly and can never remember which is which. Try this Father: think of the ‘r’ and ‘t’ and keeping the two es between them so as to be discreet and not exposing them to the other letting, whilst in ‘discrete’ the two es are separated. Silly, but it might help. I finally made the time to read this lengthy article and I thank you for it. I particularly appreciate your remarks on “wrath”, etc. I suspect that part of the issue is that we humans are so very limited that we cannot understand love that is not bound by emotions. To think of it that way seems, to the human heart, no love at all, but rather something cold and indifferent. For example,if we consider something as horrible as the Holocaust, we wonder: could a loving Father not be enraged by this? Or at least deeply saddened by it? We do not know how to answer these questions. If we say that God is not enraged and saddened, we may lose faith – for such a God does not seem at all loving to us. If we say He is, then we have reduced God to our own passions. In fact, the former notion is so unacceptable to us that we humans kill each other, telling ourselves that we are doing God’s will – because surely He too much be enraged if He is loving and just. I realize that I am diverging some from your primary topic but I think this is tripping point for many. If we recognize that God’s nature and love so transcends anything that we can understand, we can allow Him to draw us into His life rather than trying to draw Him down to our limited views and passions.